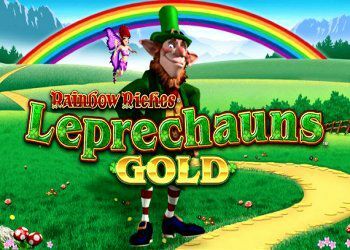 The Rainbow Riches Leprechauns Gold slot from Barcrest has 7 reels, 5 rows and 50 winning lines. Play Rainbow Riches Leprechauns Gold with great features. The “Rainbow Ring Bonus Spinner” contains “Wild Rover”, “?” bonus and “Free Spins” bonuses. The Leprechaun lends a helping hand during the “Lucky Leprechauns” bonus, as he increases the number of bonus symbols on the reels. This game includes a Big Bet option that can be played over multiple stakes to unlock the incremental advantages. 3 or more bonus symbols anywhere in view on the reels triggers the “Rainbow Ring Bonus Spinner”. The “Rainbow Ring Bonus Spinner” is populated with various combinations of bonus symbols, “?” bonus symbol, “Wild Rover” and “Free Spins”. When the “Rainbow Ring Bonus Spinner” stops spinning, the bonus symbol directly above the arrow is awarded.